Many perceive a cash drawer as simply a metal box used for storing cash. While this discernment may be true to millions of shoppers it could not be any further from the truth for the shop owners. The European Central Bank’s November 2017 report revealed that cash accounts for approximately 79% of all point-of-sale transactions in Europe, so it is easy to see why cash drawers are at the heart of every successful retailer’s cash management system. APG has maintained over two decades of long relationships with the biggest global brands within the grocery sector. Listening to retailers and monitoring consumer behavior in the marketplace ensures APG delivers a diverse range of high quality cash drawer solutions that meet individual business needs. Seamless transactions at the POS are essential to consumers, as highlighted by Adyen’s Retail Therapy report which revealed 57% of UK shoppers stated that queuing is their biggest frustration. This means that for retailers, finding the cash drawer solution to perfectly complement their business is crucial and could mean the difference between winning and losing customers. Whilst consumer expectations are high, there is a wealth of opportunity in the marketplace according to the Institute of Grocery Distribution who forecast 3.8% growth annually until 2022 for Europe’s grocery retail market. years. We realise that there are retailers who find a high security cash drawer important — it protects both cashier and their revenue at the point of sale. For example both Lidl France and Spain are using a highly customized cash drawer with unique security features in store locations with high cash theft.. . Global grocery chains such as Metro Group with over 1500 retail locations in 34 countries needed robust bespoke cash drawers to tackle multiple currencies, improve logistics via universal cash drawer models, and for purchasing and local cashier needs. APG created a bespoke cash drawer to operate in all of Metro Group’s retail landscapes while using four unique till insert solutions to handle the individual currency distinctions of each store location. 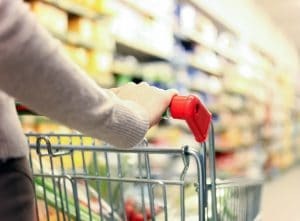 With 8 out of 10 shoppers abandoning their purchase when faced with a large queue (HIM research presented at NACS Convenience Summit Europe 2017), the demand for speed and convenience is high and with retail space at a premium retailers need to find a solution that also allows room for promotional opportunities at the POS. Large grocery chains such as Ahold use APG’s U-Shape cash drawers , while Aldi Nord adopted an extremely narrow 600mmwide Flip Lid, due to its special footprint, fitting in front of the scanner, maximizing ergonomics and speeding up transactions. Tesco, the world’s 9th largest and the UK’s number one supermarket chain, has been a customer of APG’s for over 25 years, they rolled out APG’s pioneering cash management solution, the SMARTtill Intelligent Cash Drawer, to reduce cash loss, redeploy labour hours and improve the customer experience. While the total value of the popular euro banknotes in circulation continues to rise year-on-year in Eurozone countries, reaching €1.1 trillion according to the European Central Bank, it is clear cash is going nowhere. As a result, retailers require cash drawer models to tackle business vulnerabilities at the POS, from customer and user experience to space optimization, loss prevention, and allocation of resources. 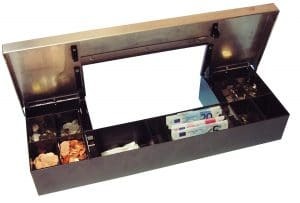 So it will be of no surprise when shopping at leading grocery chains in Europe that you will most likely encounter one of our bespoke cash drawers.